Red Dwarfs Dusty Disks - Universe Galaxies And Stars Section. 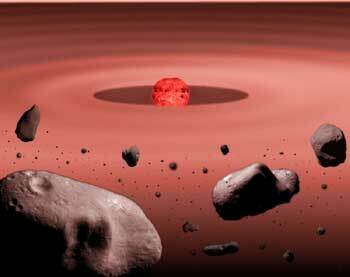 Red Dwarfs Destroy Their Dusty Disks. Red dwarfs are smaller and cooler than our own Sun, but they account for 70% of the stars in our galaxy. Astronomers have wondered why there are so many red dwarfs, but they never seem to have protoplanetary discs of dust surrounding them, indicating the formation of new planets. These stars are too small to remove dust the way larger stars do it, but Astronomers from UCLA think they could be using a process called "stellar wind drag". Even though they're smaller, red dwarfs can have very intense magnetic fields, producing a powerful solar wind. It's this solar wind that removes the dust, hiding evidence of planet formation. "We would like to understand whether these stars form planets, as the other stars in our Galaxy do," said Plavchan, who leads this research investigation. Approximately half of all newborn stars are known to possess the materials to make planets. When stars are born, the leftover materials form what Astronomers refer to as a primordial disk surrounding the star. From this primordial disk, composed of gas and small grains of solid material Astronomers call "dust," planets can start to grow. As these "planetesimals" grow by accreting nearby material in the primordial disk, they also collide with one another. These collisions are frequent and violent, producing more dust forming a new disk of debris after the star is about 5–10 million years old. In our own solar system, we see evidence everywhere of these violent collisions that took place more than 4 billion years ago - such as the craters on the moon. The debris disk of "dust" left over from these ancient collisions in our own solar system has long since dissipated. Astronomers, however, have discovered many young stars in the local part of our Galaxy where these debris disks still can be seen. These stars are caught in the act of forming planets and are of great interest to Astronomers who want to understand how this process works. Curiously though, only two of these stars with debris disks were found to be red dwarfs: AU Microscopium (AU Mic) and GJ 182, located 32.4 light-years and approximately 85 light-years from Earth, respectively. "We have to consider how the dust in these young red dwarfs gets removed and where it goes," said Jura, Plavchan's thesis adviser. In other young, more massive stars - A-, F- and G-types - the dust primarily is removed by Poynting-Robertson drag, radiative blowout and collisions. "These first two processes are simply ineffective for red dwarfs, so something else must be going on to explain the disappearance of the debris disks," Plavchan said. Stars like our Sun and red dwarfs possess a stellar wind - protons and other particles that are driven by the magnetic fields in the outer layers of a star to speeds in excess of a few hundred miles per second and expelled out into space. In our own solar system, the solar wind is responsible for shaping comets' tails and producing the Aurorae Borealis on Earth. "Stellar wind drag can 'erase' the evidence of forming planets around red dwarfs by removing the dust that is produced in the collisions that are taking place. Without stellar wind drag, the debris disk would still be there and we would be able to see it with current technology," Plavchan said.